Many areas of the Midwest that basked in sunny weather in the mid-70 degrees Monday will likely be shivering under a blanket of snow within 48 hours. A snowstorm is expected to produce "very heavy snow accumulations" and blizzard conditions across the Plains and the Midwest region starting Tuesday and stretching into Thursday, according to the National Weather Service. Approximately 10 million people are under weather alerts, including blizzard warnings, and approximately 26 million people are under alert for high winds, which are expected to tear through Wyoming, Colorado, South Dakota and Nebraska on Wednesday. In cities such as Denver, Minneapolis and Chicago, summer temperatures Tuesday would be followed by massive drops Wednesday of 30 degrees or more. In Denver, 80 degree weather Tuesday was forecast to be followed by 44 degree weather Wednesday. While some areas of the United States are set to experience weather whiplash, blizzard warnings were in effect in parts of Nebraska, South Dakota and Minnesota, according to the weather service. More than 8 inches of snow is likely from southwest Wyoming through northern Nebraska, much of South Dakota and into southern Minnesota, the weather service said — with accumulations of 18 inches or more in isolated areas. The weather service said the precise track of the storm made it difficult to pinpoint where the worst impacts would be felt. But it said snow was expected to begin falling in the Northern Rockies by Tuesday and to spread into parts of the central United States by Wednesday, continuing into Thursday. "All of these weather elements mean one thing, a very impactful event," the weather service's Minneapolis office said. "This would include widespread travel impacts, and the anticipating of more river flooding once this all melts in the next week." The rapid approach of the storm means many areas of the Midwest that basked in sunny weather in the mid-70 degrees Monday will likely be shivering under a blanket of snow within 48 hours. "We're just waiting for these big changes," Ron Demers, a meteorologist for NBC affiliate KITV of Sioux City, Iowa, said. "Blizzard conditions are not out of the question, certainly." NWS snowfall forecasts for blizzard are unbelievable ... huge area of 12"+ up to 26"
Interstate 90 will be buried on Thursday. 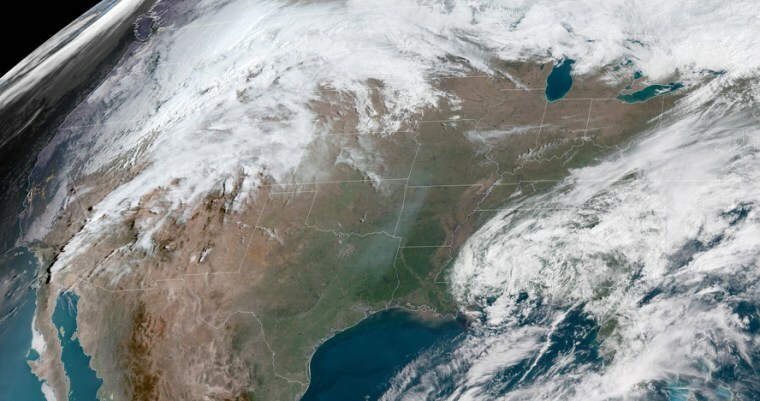 Even worse, strong winds accompanying the storm will reach over a wider area into the Southwest and the Southern Plains, with some gusts reaching hurricane force, the weather service said. "This will result in substantial travel impacts, with travel becoming difficult to impossible Wednesday through Friday" in some parts of the central United States, it said.